These machines were originally developed for measuring the air permeability of textile materials and are, in fact, the standard air permeability testing machines in the industry for quality control, research, development, performance and purchase specifications. It was quickly discovered that these machines are equally adaptable for measuring the air permeability with great accuracy and precision of any material that can be fitted to the physical dimensions of the machine. These materials include all fiber products such as paper, felt, nonwoven materials, filter’s and even wire cloth. 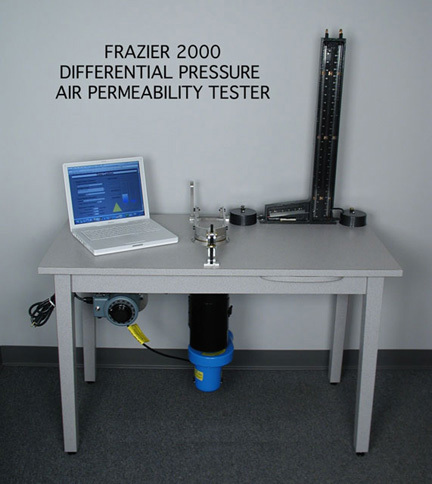 The Frazier 2000TM is the next generation of Differential Pressure Air Permeability Instruments. This new instrument implements electronic pressure sensing as well as computerized logging and manipulation of the electronic measurements. 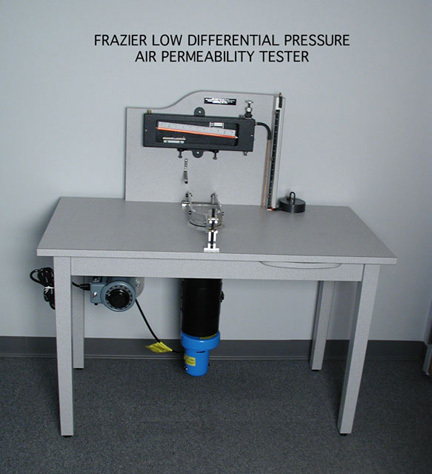 The Frazier 2000TM brings a whole new era of reliability and productivity to the field of permeability testing and measurement. 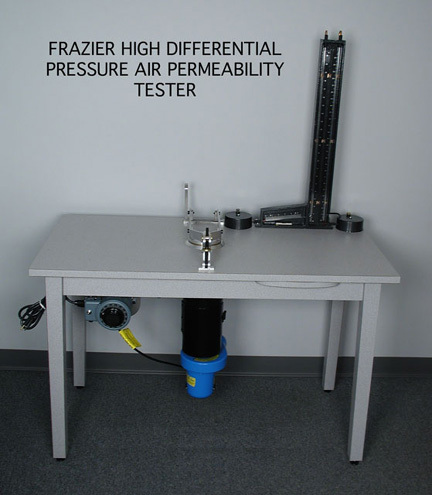 The Frazier 2000 TM has all the same features of the High Pressure Permeability Instrument. The Differential Pressure Air Permeability Machines are exclusively calibrated by two separate methods for accuracy and reliability to insure that all permeability Machines are as identical as possible in their performance characteristics and accuracy. The calibrations include the procedures originally developed and recommended by the National Institute of Standards & Technology. In addition to the calibration, a test plate is provided to quickly and easily check individual machines and cross check between different machines and accuracy and reliability of the Permeability Machines. These test plates have been used successfully over 25 years by a Task Group of the ASTM Committee D-13 as an inter-laboratory comparison to verify the accuracy of the Air Permeability Machines. These are instruments that measure permeability of substances, namely, units composed of manometers and electronic sensors that measure differential pressure to evaluate air flow, coolness, warmth, penetration of coatings, retention of additives, filter ability, water resistance, and denseness after use of samples, including, textiles, nonwovens, filters, fibrous materials, geofabrics, paper, slintered metals, wire cloth, architectural materials, plastic films, porous materials, clothing, breathing masks, protective equipment, automotive materials, rubber, leather, laminates, aerospace products, parachutes, and air bags. Experience over many years of production and quality control has shown that these machines have not changed in their calibration values as long as there is no mechanical damage and the machines are kept clean and in good operating condition. These machines are the most accurate available and work on the differential pressure principle as measured by manometers. Their accuracy, dependability, and simple operation are characteristics which resulted in their worldwide use in research, quality control, development, and testing for conformation with purchase and performance specifications.